It’s not just about the numbers. Like many, I’m a huge fan of getting deep into real estate stats, but the truth is there are so many other ways to sniff out what the market is doing. Thus I’ve created a list of some of the things on my radar lately that help say something about the temperature of the market. Then for those interested, let’s crunch some numbers with my big monthly Sacramento market update. I’d love to hear your take. Any thoughts? Facebook Posts: I can’t tell you how many posts I’ve seen lately saying, “Hey, my friend needs to rent a house. Anyone have something?” Seeing an increasing number of posts like this on Facebook or Nextdoor.com is definitely a symptom of rising rents and scarce inventory. Celebrity Flipping Seminars: Last week an HGTV flipping couple hosted a 4-day “how to flip” seminar in Sacramento, and this week a different “guru” is coming to town. If anything, this tells us the market for flipping has passed. Riskier Loans: As more lower-down payment loan products hit the market, it reminds us buyers need more options to afford higher prices. 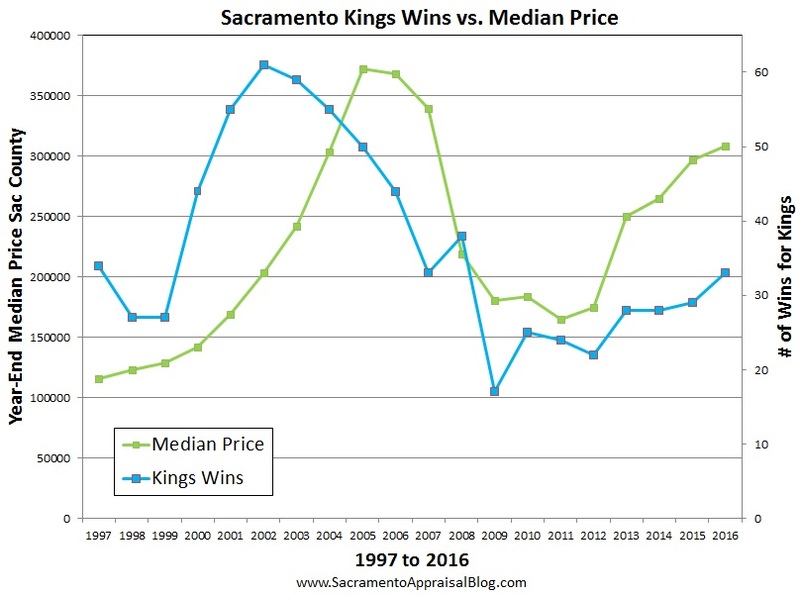 Sacramento Kings Wins: Here is an image to show the relationship between an NBA team winning and the housing market. Okay, there really isn’t a connection, but it almost looks like there is (you can make numbers say whatever you want). Less Property Tax Appeals: As the market has improved, assessment appeals have declined every year since 2008 in Sacramento County. Right now home owners are enjoying equity again and they’re hardly paying attention to their property tax bills. Here is an image to back that up. More Divorces: As the housing market has rebounded, it seems there are more divorces. I’ll admit stats are tricky in that some sources say divorces are increasing and others say they are not. It may be my personal experience, but I’ve done more divorce appraisals these past 2-3 years than I have in the previous ten years. Builders Being Less Cooperative: I’ve heard from several agents lately about local builders being less cooperative with agents representing buyers. That’s fairly normal for builders of course, though being less cooperative is certainly a luxury afforded by a market with tight inventory too. In other words, if the market had three times the housing supply, conversations might go differently at the sales office. The word “shift”: There is so much emphasis right now on the market shifting or maybe doing so in coming time. When the real estate community uses terms like shift, change, correction, or bubble, it can sometimes highlight what the market is doing (or at least what is on the mind of the real estate community). Question: What is #9? I’d love to hear in the comments below. By the way, scroll to the bottom if you want to see some of my recent woodworking projects. DOWNLOAD 70 graphs HERE: Please download all graphs in this post (and more) here as a zip file (or send me an email). Use them for study, for your newsletter, or some on your blog. See my sharing policy for 5 ways to share (please don’t copy verbatim). Thanks. Quick Market Summary: Yep, the stats show the market has been increasing. This doesn’t mean every single price range or neighborhood is going up in value, but county and regional data are definitely showing that trend overall. One of the bigger narratives is that housing inventory is still down by 15% in the region compared to last year. Sales volume has been up slightly for the year and it took 6 less days to sell last month compared to the previous month. For context, last year at the same time it was taking an average of 8 days longer to sell. This reminds us the market has been more competitive this year compared to last year, though don’t take that to mean value increases have been extremely aggressive. Last month the median price increased by nearly 2% in the region, and the average price per sq ft increased by 2.5%. Overall most value stats are up a good 8-10% since last year, though remember it’s not the same market as it was in 2005 when we’d say, “My house went up by $10,000 last month.” It’s still important to price correctly unless you want to sit instead of sell. It took an average of 27 days to sell a home last month, which is 4 days less than the previous month. The sales to list price ratio was 100% last month. It took 8 less days to sell this May compared to last May. Sales volume was up nearly 4% in May 2016 from May 2015. There is only 1.35 months of housing supply in Sacramento County. Housing inventory is 22% lower than it was last year at the same time. The median price increased by 3% last month. The median price is 9.6% higher than the same time last year. The avg price per sq ft increased by 1.8% last month. The avg price per sq ft is 9.9% higher than the same time last year. It took 6 less days to sell last month compared to the previous month. The sales to list price ratio was 99% in the region last month. Short sales and REOs were both 3% of sales last month. There is 1.6 months of housing supply in the region right now. Housing inventory is 15.6% lower than it was last year at the same time. The median price increased 1.7% last month from the previous month. The median price is 6.8% higher than the same time last year. The avg price per sq ft increased 2.5% last month. The avg price per sq ft is 8.4% higher than the same time last year. It took 2 less days to sell a house last month than April. It took 1 less day to sell this May compared to last May. Sales volume was up 3% in May 2016 compared to last May. FHA sales were 16% of all sales last month. There is 1.84 months of housing supply in Placer County right now. Housing inventory is 12.4% lower than it was last year at the same time. The median price is about the same as it was the previous month. The median price is up 7% from May 2015. Short sales were 2.1% and REOs were 1.7% of sales last month. My Latest Woodworking: By the way, I know this post has been ridiculously long already (on purpose since it’s my big monthly market update), but here are some of my recent woodworking projects. If you didn’t know, I like to tinker and create. Question: Any other market insight you’d like to add? I’d love to hear your take. It’s easy to explain what the market did, but what is it doing now? Everyone and their Mom can sound like an expert with the benefit of hindsight, but how do we see the current market? Do we give more weight to recent sales or listings? Do we have to wait for sales to close to know how the market is unfolding? Let’s consider a few thoughts below. I also have my big monthly market update at the bottom of this post for those interested. Any thoughts? Sales show us the past: A sale might close escrow today, but does it really tell us about the market today? Not necessarily. A closed sale on April 12, 2016 probably got into contract in early March, so it likely tells us more about the market 30-45 days ago rather than today. The current market in April could actually be higher or lower, so it’s important to ask how value has changed if at all. Pendings help us see the current market: The current market is often better seen in the pendings and listings rather than the sales. This assumes we have enough solid data of course. One of the most practical questions we can ask is whether properties are getting into contract at higher levels or not. Simply put, if pendings are higher than the most recent sales (and they’re not padded with concessions), they helps us see the current market has probably increased in value. Other questions to consider: Are properties getting into contract more quickly? Is inventory going up or down? Is the sales-to-list price ratio increasing or declining in the neighborhood? Are sellers offering incentives to buyers or not? It’s easy to be so fixated on sales that we don’t ask these questions, but the answers help us gauge current trends. Remember though, sales might tell us about the past, but we still give them strong weight because they actually closed at that level. After all, pendings might not end up selling. In that sense we have to “appraise” the pendings too. Are they reasonable? Do they reflect the market? Or are they outliers? Getting bid up to “no man’s land”: Sometimes in a frenzied market, properties can easily get into contract for more than they are worth. Yes, the market has been aggressive and values have been increasing (see trends below), but sometimes properties are simply getting bid up to “no man’s land” so to speak. In other words, there just isn’t any support for a value that high based on all market data. Remember, even when housing inventory is incredibly sparse like it is right now, there still has to be support for the value. We can’t just list at an astronomical level or let offers get bid up way beyond what is reasonable and expect a magical appraisal to meet the contract price. Making or not making market adjustments: If the market has changed since the sales went into contract, appraisers may need to account for that with a market conditions adjustment. If you didn’t know, appraisers can give an up or down adjustment to the comps if the market has changed since the comps went into contract. In fact, if an adjustment is not given when it should be given, the appraised value could easily reflect the market in the past rather than today. Appraisers need to consider what a real market adjustment for time might look like. For instance, last week I used a comp that was nearly one year old since recent sales were sparse, and I gave an 8% adjustment up since the neighborhood market has increased in value by that much. I could have given a small token adjustment that I just made up, but 8% was very reasonable based on more recent sales and current pendings. DOWNLOAD 87 graphs HERE: Please download all graphs in this post (and more) here as a zip file (or send me an email). Use them for study, for your newsletter, or some on your blog. See my sharing policy for 5 ways to share (please don’t copy verbatim). Thanks. Quick Sacramento Market Summary: It’s been aggressive out there. This is why many real estate professionals are comparing the current market with the beginning of 2013. There are certainly similarities, though the market three years ago had very rapid appreciation and all the metrics show it was hands-down more aggressive than it is today. We can talk about the differences in the comments if you’d like. Values overall saw a healthy uptick last month, it took 12 less days to sell a house compared to the same time last year, and housing inventory is currently over 25% lower than it was last March. Sales volume was up about 4% last month compared with the same time last year, and interest rates declining has certainly helped draw more buyers out (which doesn’t help with the low inventory problem). FHA had been increasing in the Sacramento market, but in light of how aggressive the market is out there, FHA buyers have begun to get squeezed out. FHA buyers were still 23% of all sales last month, but that’s down from 25-28% for multiple months in a row. It’s worth noting bank-owned sales are up very slightly. Some REO brokers have said they are starting to see more action in their REO pipelines, though so far there really isn’t any big change as REOs were only 5% of all sales the past quarter. It took an average of 37 days to sell a home last month. It took 9 less days to sell last month that the previous month. It took 10 less days to sell this March compared to last March. Sales volume was up nearly 4% this March compared to March 2015. There is only 1.2 months of housing supply in Sacramento County. Housing inventory is 26% lower than it was last year at the same time. The median price increased by 2% last month. The median price is 8.7% higher than the same time last year. The avg price per sq ft increased by 2.3% last month. The avg price per sq ft is 8.3% higher than the same time last year. It took 9 less days to sell last month compared to the previous month. It took 9 less days to sell this March compared to last March. Sales volume was 2.5% higher in March 2016 compared to last March. Short sales were 3.5% and REOs were 5.2% of sales last month. There is 1.5 months of housing supply in the region right now. Housing inventory is 19% lower than it was last year at the same time. The median price increased 3% last month from the previous month. The median price is 7.2% higher than the same time last year. The avg price per sq ft increased 1.6% last month. The avg price per sq ft is 7.6% higher than the same time last year. It took 14 less days to sell a house last month than February. Sales volume was 11% lower in March 2016 compared to last March. FHA sales were 18% of all sales last month. Cash sales were 20% of all sales last month. There is 1.8 months of housing supply in Placer County right now. Housing inventory is 3% lower than it was last year at the same time. The median price declined 2% last month (take with a grain of salt). The median price is up 6.5% from March 2015. Short sales were 3.2% and REOs were 2.4% of sales last month. Questions: Any other points to add about sales vs. listings? How else would you describe the market right now? I’d love to hear your take and what you are seeing in the trenches.